Exciting news! The trail into Fort Bragg's famous Glass Beach is getting a make-over. Even more exciting is that construction has begun on the Fort Bragg Coastal Trail - for the first time in decades, pedestrians and bicyclists will be able to enjoy the beauty of the Fort Bragg Coast. Here is a link to the City of Fort Bragg's Master Coastal Trail plan. A small hitch is that land access to Glass Beach is going to be closed from August 18 through November 30, 2014. For tidepools, one should definitely consider the tidepools of Mackerricher State Park. For a gorgeous place to watch the sunset, Pomo Bluffs Park can't be beat. And one never knows what else they might encounter there . . .
An immature red shouldered hawk watches over Chicken Point. Pudding Creek Beach is a great place for playing in the sand. The headlands around Pudding Creek are amazing too. When I first moved to Fort Bragg, I remember walking on the Pudding Creek Headlands and seeing/hearing someone playing bagpipes. I also have enjoyed sitings of Pacific Whitesided Dolphins and Gray Whales at Pudding Creek, and of course walking across the iconic Pudding Creek Trestle. For those who have the compulsion to collect glass from glass beach, you may find sea glass on our other beaches; however, how about a new spin on things - collecting plastic from the beach. Sea glass is not harmful to marine life but plastic is. Perhaps you can turn your trash to treasure like our friends of the Washed Ashore Project or just feel good knowing that you did your part to keep our oceans healthy. 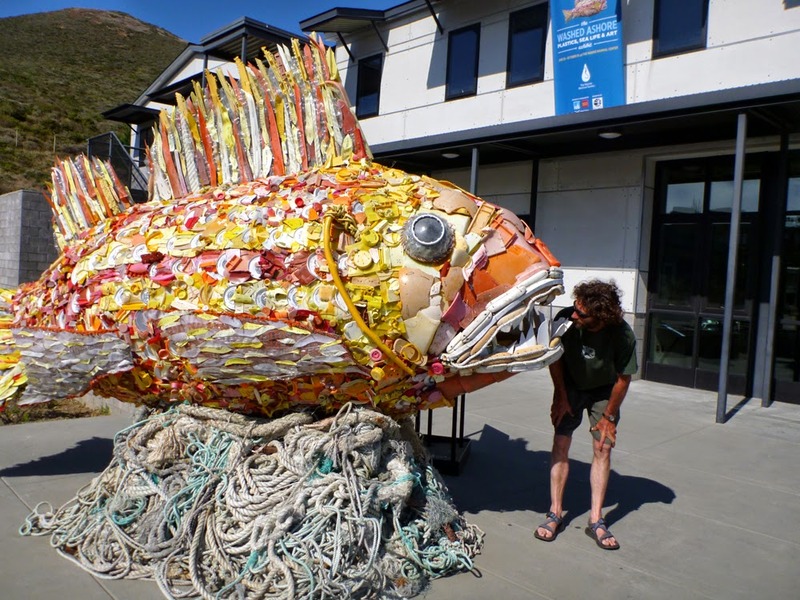 Jeff meets Henry who was created from marine debris by the Washed Ashore Project. Of course, my favorite way to experience the Fort Bragg Coastline is via kayak. 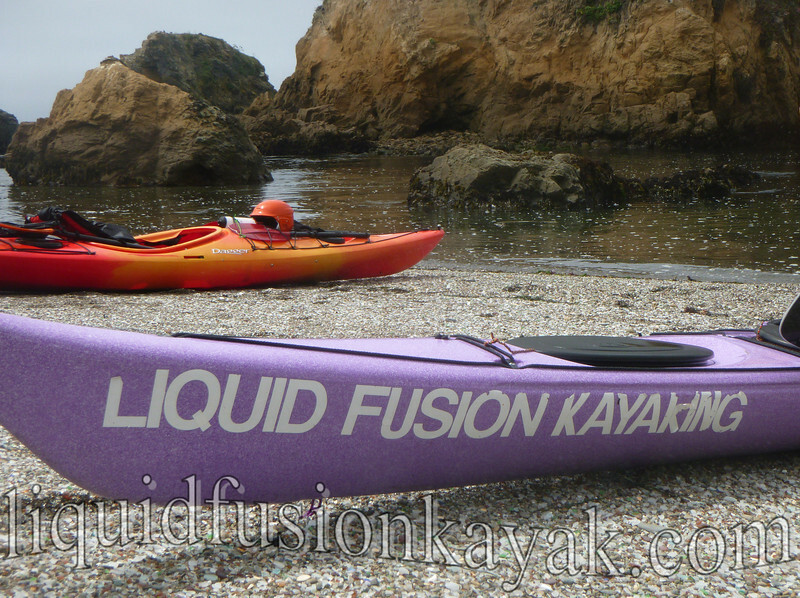 Liquid Fusion Kayaking is going to be again hosting their annual Labor Day Weekend Sea Kayak into Glass Beach Trip on Saturday August 30. It is a magical paddle through rock gardens and sea stacks, into sea caves, and onto beaches only accessible by kayak. Sea kayaks on glass beach where all that glitters is not gold but sea glass.